Hickman Pass is visible from the upper east section of Hickman Canyon. Sitting in my study and melting in summer’s heat, it’s pleasant to think about a place where afternoon thunderstorms shower the forest and cool off the mountains. That place is East Hickman Canyon in the Stansbury Mountains west of Tooele. The canyon provides access to some of the most beautiful areas of the Stansbury Range, and has a good network of trails. 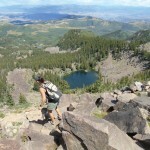 I have hiked a lot in this area and have a general description of several hiking choices. If you head south of Grantsville on Mormon Trail Road for about 10 miles, you will come to East Hickman Canyon Road on the right-hand side after you pass South Mountain on your left. Turn right and proceed west on the canyon road. It follows the north rim of a ravine for a ways and then drops precipitously to the canyon bottom. Follow the dirt road west for about 5.4 miles and on the right you will arrive at the Hickman Canyon Trailhead. It has a large parking area with an information kiosk that shows a trail map of Hickman Canyon and historical information. This is an ideal place to park and then proceed out on foot. About .27 of a mile up the canyon road, you will come to a fork. The rough road to the right is for “Bear Fork.” Go right and as you walk through Gambel oak, notice the conspicuous mine opening high on the cliff to the east. I’m not sure what kind of ore they were trying to obtain from that adit. I similarly wonder how the heck the miners got up there. The last time my wife and I visited East Hickman Canyon, we followed the old Bear Fork road north for about 1.8 miles to a wood rail fence and a Forest Service sign marking the junction with the Stansbury Front Trail. Along the canyon bottom in Bear Fork to this point, the foliage is thick and green with small streams running from 10,000-foot-high ridges to the west and draws draining 9,203-foot-high Bald Mountain to the east. There are large shady cottonwoods and, farther up, some fine stands of large aspens where at least three ruined old log cabins are now in advanced state of decay. From the rail fence, you can follow the Stansbury Front Trail north up to Box Elder Pass and if you’re up to it, follow this trail all the way north to West Canyon with stops in South Willow, North Willow and Davenport canyons along the way. We decided to take the trail that doubles back to the southwest from the rail fence heading toward Hickman Pass at the head of Big Hollow. This trail is absolutely gorgeous. The greater part of it goes through meadows of tall green grass and numerous wildflowers. The trail weaves in and out of various draws on the east face of 10,330-foot-high Vickory Mountain. Most of the draws are choked with dense aspen forests that give way to dark forests of conifers above. In some of these draws there are tiny clear streams with moss-covered rocks, old logs and places where the sun’s rays hardly ever reach. It is almost a jungle. When you emerge from each draw, you find yourself once again on an open green grass/sagebrush-covered slope that reminds me of the famous “The hills are alive” scene from the Sound of Music. There are several prominent peaks to the west that can be scaled if your knees and lungs are up to it. First and foremost is Vickory Peak, which has a 10,330-foot-high north summit and a 10,301-foot-high south summit that is probably the most picturesque of the two because its summit is exposed while the higher northern peak is cloaked to the top with thick evergreens. 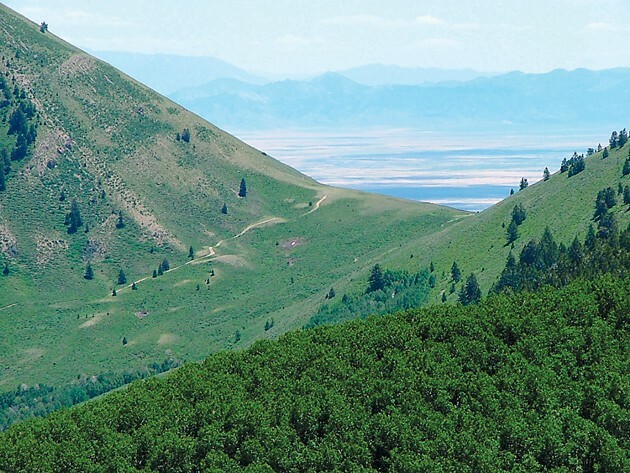 If you make it to the top of Vickory, you will be delighted to find several open spaces among the pines that offer excellent views west to Skull Valley and east to the Oquirrh Mountains. These unexpected flat areas on top of the world would make an excellent remote camp. It is an easy ridge walk from North Vickory to South Vickory. On top of the southern peak is a USGS monument that is labeled STAN 1955. You also have a bird’s-eye view of Johnson’s Pass and Clover Spring from this summit. Getting on top of the mountain is not easy. If you approach from Hickman Canyon to the east, you will fight through thick foliage and you will have to negotiate many cliffs that are sometimes hidden in the deep, dark pines. If you approach from the west, you have nearly 4,000 feet of steep mountain to conquer. Another easier, but much longer route, is to park at Johnson’s Pass and follow the gradual ridge north for six miles to the summit. 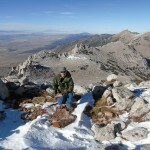 If you are up to it, a trip to the summit of Vickory Mountain is rewarding, with superb views of Deseret Peak and the rest of the Stansbury range. Another interesting peak that makes up the east wall of Bear Fork is Bald Mountain. 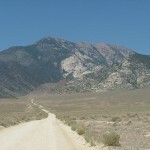 This peak is steep and conspicuous on the skyline when viewed from the southern end of Tooele Valley. To climb Bald Mountain, follow Bear Fork up to the Stansbury Front Trail and then follow that trail north to Box Elder Pass. The route up to Box Elder Pass is easy going. But from that point the going gets rough as the last 1,000 feet are steep on an open grassy ridge. Due south across Hickman Canyon from Bald Mountain is a relatively unknown mountain that I call “Morgan Canyon Peak.” A canyon of the same name splits the mountain up the middle from west to east. 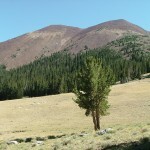 I camped on the steep slopes of this peak in the pines several years ago and then walked the summit rim the next morning. The north-facing slopes of this peak are densely forested with thick stands of dark green fir, but the rounded summit is a grassy knoll from which you have an aerial view of Rush Valley and St. John. Whichever peak you decide to climb, or trail you decide to follow, East Hickman Canyon will not disappoint, especially if it’s your aim to escape the summer heat. Keep in mind there are a few parcels of private property that should be avoided; in particular, the old concrete slabs at the head of the canyon. You can drive by these on your way to Hickman Pass but you should obey all “no trespassing” signs. A vast majority of this canyon is part of the Wasatch National Forest. For more information, call the Wasatch National Forest recreation line at 801-466-6411. Please obey all of the trail restrictions and pack out all of your trash.